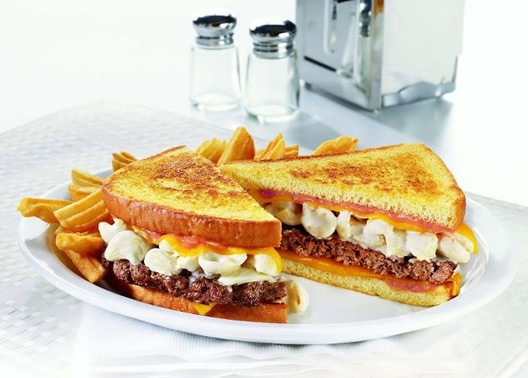 A COW-orker sent us this awesome new sandwich from Denny’s – the Big Daddy Patty Melt. At first we thought it was a joke – something out of The Onion – then we realized the Mac ‘n Cheese Big Daddy Patty Melt was real! If anyone has tried it please let us know in the comments or on Facebook. The ultimate cheesy choice with the Mac ‘n Cheese Big Daddy Patty Melt – a hand-pressed beef patty topped with new creamy Mac ‘n Cheese, melted cheddar cheese and zesty Frisco sauce on grilled potato bread, served with a side of wavy-cut French fries. That’s right, no sandwich is too small or meat too mighty to benefit from just a little more cheese. 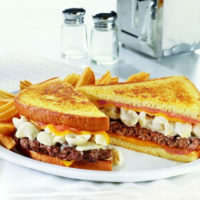 Last year Denny’s introduced the Fried Cheese Melt. Anyone with a significant other knows that you have to outdo yourself each year but Denny’s went a little too far and nearly doubled the calorie count (1690 for the Big Daddy Patty Melt and a mere 895 for the Fried Cheese Melt). Take it easy Denny’s, save some calories for next year! For dessert try the Strawberry Pancake Puppies® or the Strawberry Cheesecake Milkshake! You can get any of the breakfast items with “extra ooze” for only $0.69 more. HA! Great review had a very simlair experience with this burger a couple of weeks ago.Denny’s seems to be on a mission to make a sandwich version of it’s breakfast dishes and this was not too bad. For me, the hash browns made the sandwich, but the flavor of the meat was not as good as I hoped it would be. But the toppings made up for it!This I may try again or the other breakfast sammich the grand slamwich.DocPS really dig your blog!